Recently, the WVCSD music department held its 19th annual “String Fling” concert, marking the 19th year the orchestra program has been in existence in the Warwick Schools. 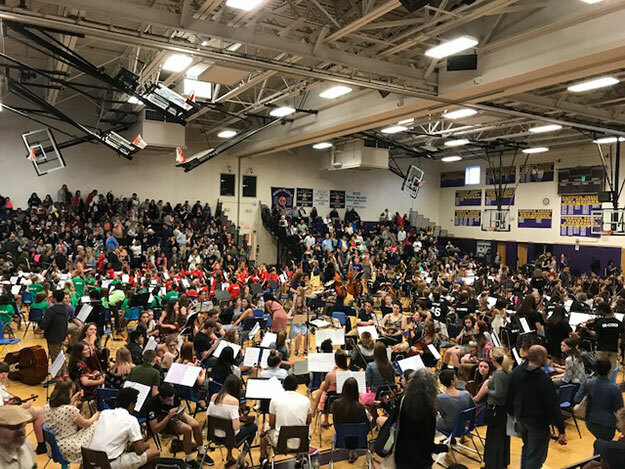 391 orchestra students from grades 4-12 participated in this impressive undertaking, which has every string musician in the school district performing together under one roof! The 4th Grade Orchestra & PIE Gr. 5 orchestra students, directed by Tammy Moser. The final piece of the evening, “What is Love,” was performed by all WVCSD Orchestra students. The pop piece was arranged by WVCSD Orchestra alumni Nicole Bartolotta six years ago for her Senior Project.